The driver of Prema Powerteam on Dallara and that of JD Motorsport on Mygale securred the pole positions for the first two races. 04/05/2012 - Two Italian drivers on pole in the second round of the Italian Formula 3 European Series. Eddie Cheever (Prema Powerteam) has been the quickest in race one's qualifying at Hungaroring as the driver from Rome clocked a fastest time of 1'38''532. Riccardo Agostini (JD Motorsport) will start race two on pole instead as the only driver on Mygale stopped watches in 1'38''133. The two drivers will share the front row in race one as well as in race two: Agostini obtained in fact the second time in qualifying 1 with a time just 26 thousands higher than that set by Cheever, while Prema's driver was 22 thousands slower in the other session. 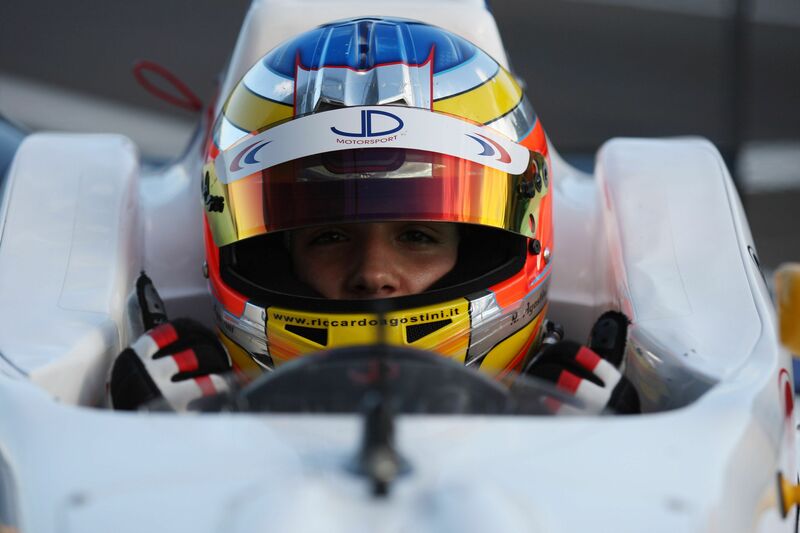 Very satisfied was JD Motorsport's driver that managed to take again a Mygale in pole position after Hockenheim 2010 race of the Italian Formula 3 Championship, when the fastest time was set by Eurointernational's Gabriel Chavez. Agostini. Agostini declared: "I am quite satisfied even if I am pretty sure I could have been quicker both in Q1 and Q2. In the first session I made a small mistake in my fastest lap and that cost me those 26 thousands to Cheever, while in the second I had to slow down a bit as I found yellow flags in my best attempt". The third position in both races went to the championship leader Henrique Martins (Prema Powerteam) who will have team mate Brandon Maisano on his side in race one and the Russian driving for Euronova, Sergey Sirotkin, in race two. The third row of race one was obtained by Gerard Barrabeig (Team Ghinzani) and Sirotkin, with the latter competing again both in the Italian Formula 3 European Series and Auto GP during the weekend. Seventh time for Patric Niederhauser (BVM) who is going to start ahead of his former team mate in Formula ACI-CSAI Abarth, Robert Visoiu (Ghinzani). The top eight drivers ended all within one second, while Mario Marasca (BVM) Yoshitaka Kuroda (Euronova) and Nicholas Latifi (BVM) completed the last three positions. In race 2, the third row will be occupied by the French pupil of Ferrari Driver Academy, Brandon Maisano, and by the Catalan of team Ghinzani, Gerard Barrabeig. Behind him, team mate Robert Visoiu team BVM's Mario Marasca. Ninth position for the Swiss Patric Niederhauser who will have his team mate in BVM Nicholas Latifi on his side. The last position of the grid will be occupied by Yoshitaka Kuroda (Euronova). The first race of the weekend (22' + 1 lap) will start at 13.20 (GMT+2) and will be live on Rai Sport 2. Race two will start at 18.05 instead (broadcast on Rai Sport 2 at 23.30). On Sunday, green flags the sprint race will wave at 10.15 (15' + 1 lap), live coverage on Rai Sport 2.